In Part One of our article, we shared the best reasons for high school students to consider colder climates for their college choice. In this second part, we offer even more advice from alumni, this time with a focus on college campus tours. Read on, and learn how to get the most from your visits! 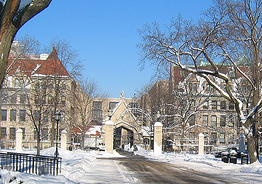 Visit campuses during both the winter and the spring. Different seasons offer different experiences. See how big each campus is and decide whether you feel comfortable walking around in cold weather. Try to plan overnight visits so you can get a better feel for life on campus. In addition to the above, talk with current students about how they have adapted to the weather. If many other people have come from warm places and made a happy home at the college, it may give you confidence that you will, too. When you are taking college campus tours, you may notice that fewer students spend time outside when the weather is cold. Remember, though, that they may be hanging out at other places on campus. During your college campus tours, ask where students socialize and check out these places. They might include the library, residence halls, or student union. See how the university helps to build a community with special events or fun common areas, and envision whether these are places you would enjoy spending time. All of our interviewees agreed that the right clothes can shape your experience on campus. If your "college map" includes cold weather schools, pack outfits that are presentable, warm, and comfortable. They will make it easier for you to pay attention during tours and to enjoy the campus surroundings. If you visit during warm weather, you can forgo the winter gear, but take the time to explore the area around campus. In particular, look for stores that sell affordable, high-quality winter clothing. If you decide to attend the college, you may prefer to buy items like a heavy coat when you arrive on campus because of the selection and lower cost these stores offer. One more note about clothing: it’s important to learn the layering concept early. Often, there are extreme differences between the cold outside and the heat inside of a classroom or residence hall. If you decide to attend a cold weather college, being able to add and remove layers of clothing quickly can help you stay comfortable. When you visit a college during the winter, pay attention to how current students get from place to place. It will give you an idea of what to expect if you attend the school. For example, a vehicle is not always the best solution. Cars can become snowed in, or they can be ill-equipped for snowy weather. Even if you are used to driving in snow and ice, not all drivers will be, so it may just be safer to look for alternatives. During college campus tours, ask about public transportation and the routes these systems take. Many students forgo vehicles and walk wherever they need to get. One interviewee said simply, “We learned how to walk fast outside. I got in the best shape of my life because of it!” Cities that experience major winter weather typically have systems for salting and plowing to help students get around. Finally, flights may be affected by extreme weather. Be sure to plan for delays if you are visiting campus as a high school student. If you decide to attend the college, be aware of how schedule changes can alter your holiday travel. So learn all you can on your college campus tours about the academics, activities, culture, and student life. You might find that the cold weather will be a backdrop to the best experience of your life.